Transform water into pure wonder. While hiking in the Swiss Alps – where the water you drink is as crystal clear and pristine as the air you breathe, Lavit’s founder reflected on his fast life as real estate mogul and set out on a new more meaningful path. For two plus years he and his team immersed themselves in designing a state-of-the-artisan machine that consistently filters every drop of water and then custom blends it with delicious and healthful flavors in a recyclable aluminum pod to create the first on-demand single serve cold beverage brewing system. The water cooler just got cooler. We used Lavit founder’s personal journey as the inspiration for our Brand Positioning, Vision, Values and Narrative as well as the Pod and Packaging Graphics. The Man in the Mountains also was designed to reflect Lavit’s environmental mission to protect pristine mountains, lakes and stream everywhere by positioning Lavit as the alternative to drink-and-toss plastic bottles and massive trucking of water and bottled beverages. The Result: LAVIT™ made a major splash in the single serve cold beverage market. At their very first Trade Show the team sold 100% of the unit production capacity. 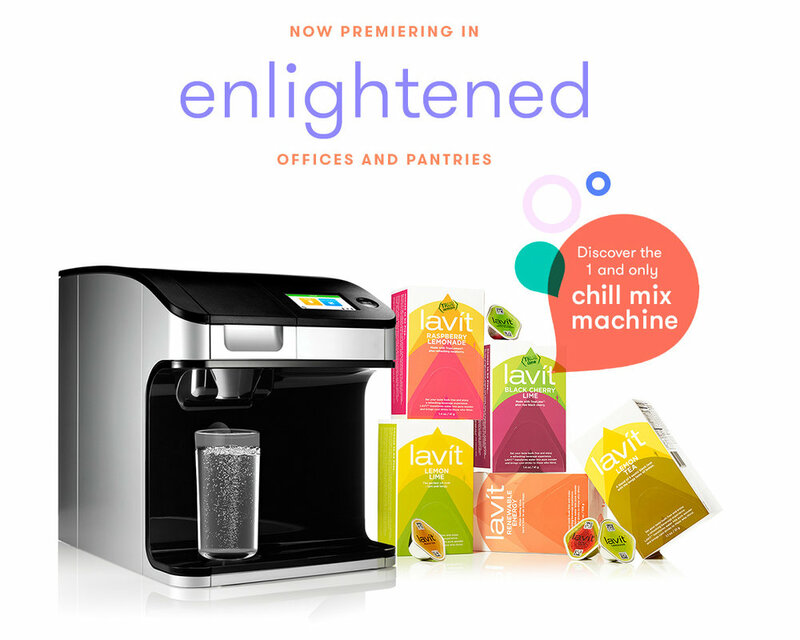 Lavit continues to be a favorite in office pantries everywhere with an ever-expanding collection of flavors. Stay tuned for the at-home version coming soon. The LAVIT™ - Latin for the Good Life – is the revolutionary, cool beverage brewing system that transforms purified water in pure wonder. Forget wimpy, weak watered down drinks. Forget tasting somebody else’s Coconut in your Kiwi. Forget sugary soft drinks and gnarly aftertaste. Forget costly, cumbersome drink-and-toss plastic bottles that can pollute parks, rivers and the ocean. Now with just a touch of a button, you can enjoy a pure, deliciously refreshing beverage, still or sparkling, with zero sugar, zero preservatives and just 10 calories.